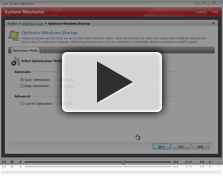 Learn how to clean and optimize Windows startup processing. Remove unneeded bottlenecks and accelerate PC speed. 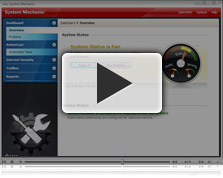 See how System Mechanic analyzes your PC and then automatically runs the specific repairs and optimizations that are needed. See how to group and re-align each program’s related files with patent-pending technology for the absolute fastest program load and run time possible. Learn how to run Total Registry Revitalizer, an all-in-one tool. 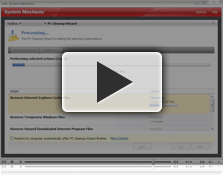 Keep your PC’s most critical component – the registry – protected, clean, and error-free. Learn how to use Designated Drivers™ to automatically update out-of-date device drivers with Microsoft®-approved driver updates. 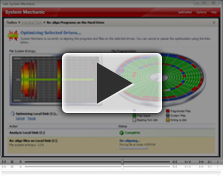 See how to automatically optimize a solid state drive and keep it running at top speeds with System Mechanic’s fully-integrated SSD Accelerator™. 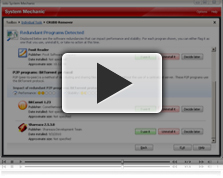 See how to find and root out speed-leaching redundant programs and other items you don’t really use or need. Learn how to defragment memory with Memory Mechanic. Reclaim valuable memory and improve PC efficiency, stability, and speed. Learn how to run NetBooster. Automatically tailor Windows settings to suit your PC and experience faster and more reliable internet access. Learn how to run PC Cleanup to clean out the unneeded files that clutter your computer and overtax its resources.